The morning of 24th January 2011 was a deep pain to all the music lovers. The Indian Classical Music lost one of his legends. The notes were orphan, saddened was the sky. The emperor of Indian Classical Music, a legend, the singer who had attained godlihood through his music, passed away. Pandit Bhimsen Joshi, one of the most extraordinary singers India has ever produced, passed away in the cosmos. India has lots of dedicated artists. It has plenty of talented performers. Bhimsen Joshi, certainly stands out among them all. He ran away at a very tender age to fulfill his musical thirst. This boy, when he was 11 years old, was so much enchanted by the divine voice of Ustaad Abdul Karim Khan, that he ran away to absorb this art. Without money in his pockets, he wandered across India to find his Guru. After a long search, he reached Savai Gandharva also known as Rambhau Kundgolkar. Bhimsen Ji served his Guru for years without even expecting anything. After testing the dedication of this small boy, Savai Gandharva was so much pleased that he opened all the treasures he had in front of Bhimsen. Bhimsen Ji used to practice for 18 hours. This tremendous practice can be felt in the very first note of his performance. It was this tremendous practice which gave Bhimsen Ji the strength to sing any note without effort, shift from one note to another just like a lightening. 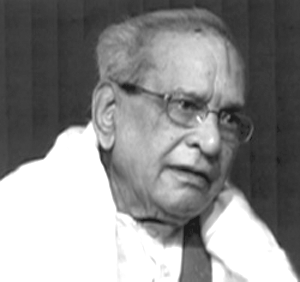 Bhimsen Joshi had a voice suitable to all the types of music. Let it be Khayal, Thumri, Bhajan, Abhang, Tarana or a Natyageet. Bhimsen Ji had an ability to present different types of compositions without damaging the individuality of them. His voice, though it was toned like hard rock, at the same time was very delicate also. While singing Darbari Kanhara or Miyaan Ki Malhar, it is as firm, bold and thrustful like a lightning. At the same time, while singing Jaijaiwanti or Maru Bihag, it was one of the most delicate voices we can imagine of. All the artists somewhere have desire to showcase their talent. Bhimsen Ji, was never worried about showing his talent. Rather, he was never present in his music, only music was there. He used to be so much absorbed and dissolved in his music, that such small thoughts, like 'I must impress people, I must enchant my crowd' was never present in his music. Thats why, his music was divine. When artist himself disappears from the art, divinity remains. Contribution of Bhimsen Joshi to the world of music is infinite. He has hundreds of records on his name which are guiding the music explorers, quenching the thirst of all the music lovers across the globe. He gave platform to many budding artist through Savai Gandharva Music Festival which today is largest music festival in India. Bhimsen Joshi was a car lover. He had quite a big fleet of cars at his disposals. He used to drive alone hundreds of miles in his classic Mercedes across whole India. Along with driving, he was a good mechanic also. He was a cricket lover. He loved dogs. He was just a layman when he was with his family. He had all the respected honours like Padmabhushan, Padmavibhushan, Bharat Ratna, Platinum Disc, Sangeet Natak Academy Award on his name, yet he was much separated and elevated from all of them. An artist is also a human being. Many a times it happens that artists with all the respect they get, consider themselves somewhat holier than others. Bhimsen Joshi was one of the most humble artists we ever had. He was almost like a saint. His music is a doorway to the divine. People used to be speechless, with their eyes filled with tears when he used to sing Bhajans. When he used to sing Abhang of Lord Vitthal, people could actually feel the presence of Lord Vitthal. So much was his totality, so much was his dedication, so much was his Sadhna. Today, though all music lovers and performers feel like losing their father, Pandit Bhimsen Joshi is still among us all in the form of his music, Ragas he created, his infinite memories and infinite impacts which his music made in infinite hearts.